Hacking a turned-off computer would require a few mistakes on your part. It's unlikely, but possible. - Ask Leo! 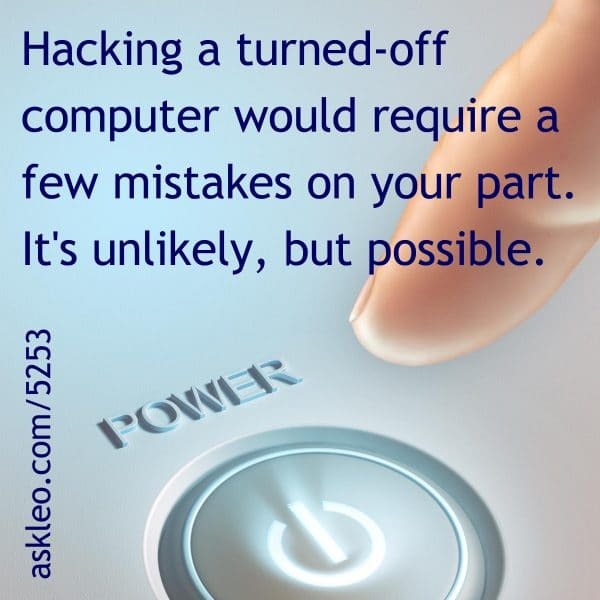 Hacking a turned-off computer would require a few mistakes on your part. It’s unlikely, but possible. Can My Computer Be Hacked If It’s Turned Off? - Hacking a turned-off computer requires a few mistakes on your part. It's unlikely, but possible. Will Someone Hacking My Router Show up on My Computer? - Router hacking is rare, but it can happen. I'll discuss what it is. Does my Windows upgrade disc require that I have the previous operating system installed? - What I'd do first is just try it. If that doesn't work then we'll have to dig a little deeper to find a solution for you. « Previous post: What if the System Idle Process is using 100% CPU on your slow system?